Achariya.net: But I'm a pretty sheep. I didn't need to dress up in Paper Couture clothing and take pictures - clearly this store has a little bit of publicity already. :D I wanted to, however, because the dress is just that pretteh. I'll be back to my regularly scheduled gothic-kawaii designers tomorrow. In other news, I'm working on my final project for my last class in graduate school. The project is a tough one, but in all it feels strange and good...like I've actually achieved getting out of here. I still have to finish writing my dissertation, but I'm going to get on with the rest of my life while I do it. 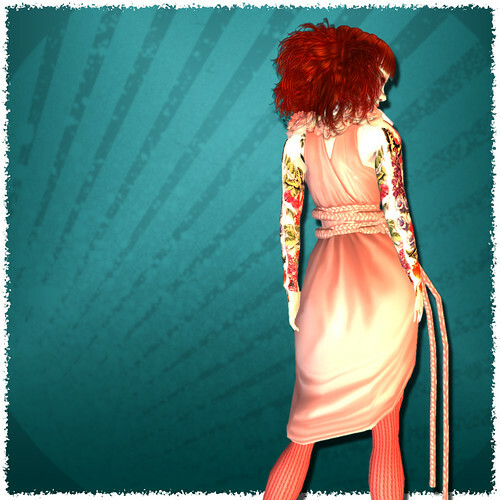 I love the tatoos - nice enhancement to the feminine "couture" idea of the dress.